Russian inmates at regional correctional facilities sculpt amazing, colorful, original figures out of ice and snow. For prisoners in the Russian regions, the snow sculpture competition is a much-anticipated event. With their bare hands they turn lumps of colored snow and ice into animals, monuments, cartoon characters and even the Kremlin. It's not only an opportunity for self-expression, but to win prizes and get unscheduled visits from relatives. Moreover, the competition helps solve the pressing issue of keeping inmates busy during their free time. The preparations for the competition got underway in early winter: the prisoners made models of the figures and planned where to put them. 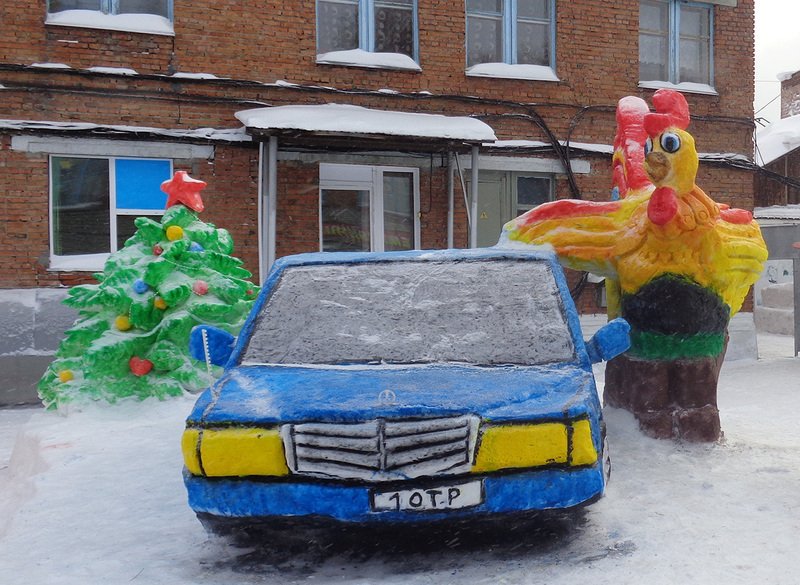 Without any special materials (only snow, water and paint) or training, they created a variety of shapes: fairy-tale characters, a tank, an ice Kremlin, cars, Father Frost and Snow Maiden and, of course, the symbol of 2017, a fire rooster. The jury assessed the works according to several criteria: creativity, sense of taste and team-working ability. The title of best sculpture was awarded to "G-Wagen," second place went to "Snow Kremlin" and third was split between "Ice House" and "Tank." Much smaller than the original, this Kremlin delivered silver for its creators. If you don't have time to pop over to the Russian Far East to see a tiger with your own eyes, why not ... sculpt one out of compacted snow. This snow "Tsar Cannon" was created in honor of the anniversary of Moscow. The heroic exploits of the defenders of Moscow, the Panfilov Division, immortalized in compacted snow. It seems that this tank is ready to drive through the prison gate. The cartoon figure "Sponge Bob" adds some childlike fun to the proceedings. The cartoon theme continues with "Squirrel" from the movie "Ice Age". Another "Tiger": this time the saber-toothed predator from the aforementioned "Ice Age" created in tandem with "Squirrel". Press Office of the FPS for the Novosibirsk Region). The brightly painted "Rooster" — the symbol of 2017. This snowy "Porsche" even has a license plate! And this "Mercedes" is a modern symbol of the holiday for the inmates, along with the figures "Rooster" and "Christmas tree". This "Crocodile" took up a position along the fence and seems to be guarding the prison. A cold-looking "Aurora" laid up for eternity.